Here are a few more recent titles to supplement this week’s theme, books about global justice, inspired by the G20 Summit and the protests in Pittsburgh. For more serious or academic titles, see the brand new list I posted over at my monthly column, here (September 09.) Some great deeper books listed there, from the new, fantastic Justice Project (which really isn’t that deep, just very comprehensive and in hardcover, so I listed it there) to the fascinating and diverse collection in The Gospel and Globalization by Michael Goheen & Erin Glanville (one of my own personal favorites) and several more excellent ones…. Here are a few to whet your appetite, perhaps more basic and less academic. handsome paperback, full color inside, similar to another fabulous one the author did on AIDS. These answers the tough questions real people ask, a simple overview of the complex issues. I have long been a fan of Ms Bourke’s journalism and writing, and here she provides a great service. Very solid information, nicely arranged and usefully presented, simple and clear. 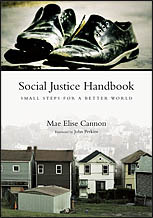 Do Justice: A Social Justice Road Map edited by Kristin Vander Giessen-Reitsma (catapult) $7.95 You may recall that we’ve promoted this before…it is a small collection of mostly great writing (aha: I have a bibliography here, too) about development, poverty, justice-education, globalization and God’s call to service, community development and such. We love the bi-weekly ezine catapult and some of these pieces were published on line. Some are new for this handsome paperback collection. Very nicely done. Everything Must Change: When the World’s Biggest Problems and Jesus’ Good News Collide Brian McLaren (Nelson) $14.99 You may know how we were somewhat involved in the hardback book’s tour, how we promoted this wonderful study of the inter-relatedness of major world problems and the framing narratives that drive them. I have used some of Brian’s brief youtube clips around this theme and tour, and then the DVD curriculum, which is very exciting, visionary, inspiring. (Email me if you want more info on that!) Now, the book is out in paperback, with a bright new cover and a provocative new sub-title. Glad that they are trying to help folk understand what this is about, how Jesus’ Kingdom ways are uniquely able to address the complexity of our broken global world, as we take up our role as “revolutionaries of hope.” I really recommend this big picture book, readable and interesting and in many ways quite profound.